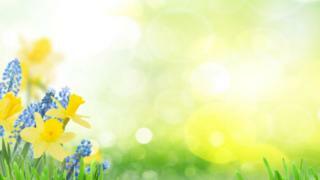 Wednesday marks the spring equinox, the midway point between mid-winter and mid-summer. The reason that that is not the case is because the earth is tilted by 23.5 degrees in relation to its plane of orbit. It's that tilt which gives rise to the seasons. In the northern hemisphere summer we're tilted towards the sun and in winter away from it. However the equinox is an important staging post on the annual orbit of the earth around the sun, particularly if you live at 54.5°N like we do in Northern Ireland. In Belfast on the winter solstice, 21 December 2018, there were seven hours and 15 minutes of daylight. On the summer solstice this year, 21 June, the sun will rise at 04:48 (BST) and set at 22:04 (BST), giving Northern Ireland 17 hours and 16 minutes of daylight. By contrast in Singapore - which is is just 1°N of the equator - the shortest day was 12 hours and three minutes of daylight, and the longest just nine minutes more. During an equinox the earth's north and south poles are not tilted towards or away from the sun and the duration of daylight is theoretically the same at all points on the earth's surface. The northern hemisphere spring equinox - the mid-point between mid-winter and mid-summer - occurs on 19, 20 or 21 March and is also known as the vernal equinox. The name is derived from the Latin word 'vernalis,' which means "of the spring". In Northern Ireland at this time of year there is a real stretch in the day. Each day this week we're adding an extra four minutes 26 seconds of daylight; a difference of more than half an hour from the start of the week to the end.